Bus this Tuesday to Dungannon leaves MVP at 1.15pm and Moira at 1.30pm. Note early time due to 2.30pm kick off. Names required for Annual Dinner on Friday 26th April. £5 levy to treasurer ASAP. 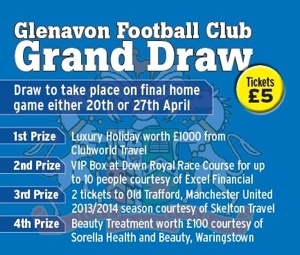 Glenavon have launched a fantastic prize draw with some amazing prizes. Tickets are priced at £5 and all supporters are urged to support this with all money going towards club funds. Tickets will be on sale from club offices, all directors and all Glenavon supporters clubs. The Glenavon Triangle supporters club will have them available at the bar. This Saturday Glenavon travel to Shamrock Park to face Portadown in the Mid Ulster Derby kick off 3pm. The Triangle Supporters club bus will stop in Moira first at 2pm before making its way to MVP for a 2.15pm pick up. You are currently browsing the Glenavon Triangle Supporters' Club blog archives for March, 2013.